I watched the series Cosmos hosted by Neil deGrasse Tyson and was fascinated by each and every show. Although may of the ideas put forward on the show were complex, Dr. Tyson explained them in simple ways that the average viewer could understand. When I heard he was coming to the Sony Centre in Toronto, I had to be there. Dr. Tyson, the host of National Geographic’s StarTalk, best selling author and Director of the Hayden Planetarium, guides the ship of imagination to transport viewers to the nucleus of an atom and the farthest reaches of the universe as he explores humanity’s quest for understanding. “I’ve put together an engaging multi-media presentation that brings the expanses of modern science directly to audience members. Fans love the Q&A sessions that rival the event itself,” says Dr. Tyson. In the past, he’s been asked a myriad of questions about everything from space elevators to parenting advice. Tyson says, “These are family-friendly events. 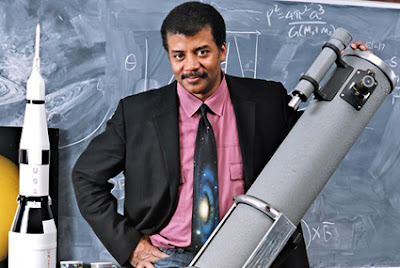 I’ll frequently take questions from children since I’m fascinated with young ones who are interested in science.” The New York City native is host of StarTalk Radio and TV show along with FOX’s Cosmos: A Spacetime Odyssey; he is a New York Times bestselling author of 10 books and is also a frequent guest on The Daily Show. President Bush appointed Tyson in 2001 and 2004 to serve on commissions studying the future of the U.S. aerospace industry and the implementation of the U.S. space exploration policy, respectively. I must say I have never been more blown away listening to a speaker. Not only is Dr. Tyson brilliant but he explains things in such simple terms that made a seemingly complex concept in a way that I could understand. For instance, he started with gravitational waves, a concept that Einstein felt in 1916 existed in the universe and was proven correct on September 14, 2015, when the waves struck earth 1.2 billion years after two black holes collided, proving Einstein right. The important part for me ... he explained it so I could understand what it was, how it was measured, and how important a discovery it was. He explained man's place on earth and how we are more closely related to mice and rats instead of monkeys, which is why they are used so much for medical research. He talked of science research through the ages, and who is leading the world now, what countries celebrate their scientists on their currency, the possibility of multiple universes, about man's voyages to the moon and how it changed mankind's perception of earth we live on. See that dot to the lower right of the picture? I took this picture during the presentation but there are better ones on-line. That is the earth as seen from beneath the rings of Saturn taken by the Cassini spacecraft on July 19, 2013. He quoted astronaut Ed Mitchell who walked on the moon in 1971 and science's best friend, Carl Sagan, host of the first Cosmos series, while we watched on how we are not looking after our planet or ourselves very well on this one small pale blue dot. Tyson spoke of so much in a really short period of time. Dr. Tyson is a natural on stage. Not only is he very excited about what he is talking about but he is funny and enjoys conversing with different people in the audience. He went long, the show was a little over two and a half hours, but not for ten seconds was it ever boring. I would go see him again in a second!